Koos is a cool guy who knows everything about rubbish. His lessons about dust and litter are a great, educational and interactive experience. A lesson about rubbish is a feast in which you learn more about dust and litter than ever before. Everyone will have an enjoyable morning or afternoon because Koos makes a swirling show from a topic that some of you may think of as boring. A lesson on dust and litter is a feast where you will learn more than you ever did. Koos dives into the classrooms’ dustbin and shows what’s inside: paper scraps, apple core, aluminium foil, empty soda cans, a juice box, another empty package and another one and another one… Koos shows you alternatives. He comes up with all sorts of creative examples and solutions. Koos presents a ‘rubbish quiz’ and takes the class outside to clean up the neighbourhood. In addition: Koos loves a good practical joke, which makes his lessons even more fun! Koos gets everyone excited to work on waste prevention! Koos’ lessons are an extraordinary experience for children to make them aware of rubbish, how to avoid waste and instead do something creative with litter. 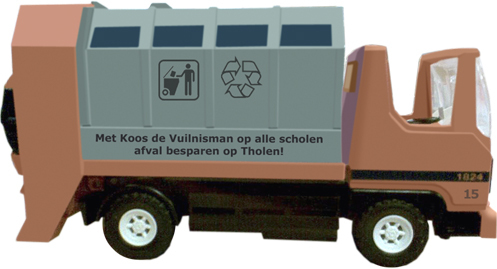 Above all, Koos teaches how waste can be prevented. Koos the Garbage Man’s lessons are strongly focused on DIY. Koos keeps in mind that children have different backgrounds, opinions and talents. Yet, he manages to encourage every one of them to look different at their environment and avoid waste. The environment of the child; school and home. The ‘Dust-lesson’ takes a half day. Benefits for schools/teachers: special and ready-to-go project. Preparation is not absolutely necessary. See also: Koos the Garbage Man in the media. 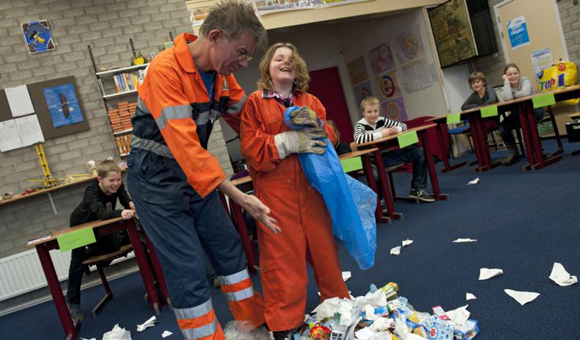 Review the guestbook of Koos the Garbage Man!